"And walk with me this way!" Are you ready to meet God? Would you be ready to meet Him today? Would you be able to stand before Him right now, in all of His holiness, and honestly say that you have known Him, lived for Him, and loved Him with your whole heart? There are those who feel that they have plenty of time to get to know God. 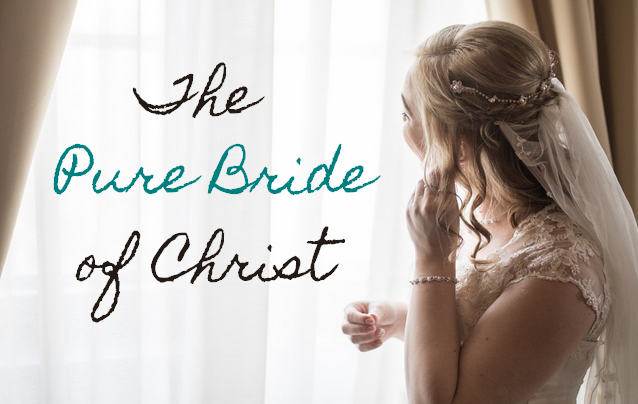 "Someday," one well-educated young man said, "I will set things right with the Lord. I am still young and have my whole life ahead of me." Unfortunately, that "someday" never came. A sudden diagnosis of cancer left him with only a few months to live. "I'm not ready to die!" he cried helplessly, pleading for one more chance at life. "I'm not ready to meet God. Not yet!" It was not long after this that his last breath was snatched away by the cold and merciless grip of inevitable death. Such sad finality. He was never again to return to this world and make things right. Never to take back those wasted and empty days that he had lived so selfishly. He had missed his only chance to get to know his Creator on a personal level. He had passed up the free gift of salvation that was offered to him and he would never be able to come back and experience the heights of joy and the depths of peace that can only come from a close relationship with the Most High God. He had never known the kindness, the compassion, the faithfulness, the security, and the love that is poured out on those who invite God to dwell within them. He had missed his chance at happiness for all of eternity. Death did not wait until he was ready. Death waits for no man, as they say. It will be the same for all of us. When your time on earth is done, it is done. Forever. The bible says, "Prepare to meet thy God" (Amos 4:12 KJV). That means that you need to begin preparing right here and right now. Do not wait another moment. Do not wait until "someday" when you have more time. Time is running out and the opportunity may never present itself again. The silent and unseen clock of your life is ticking away the seconds until midnight. Will you be ready to meet your God when the clock strikes twelve and the chimes ring out? Do not wait until it is too late. The time for God in your life is now. 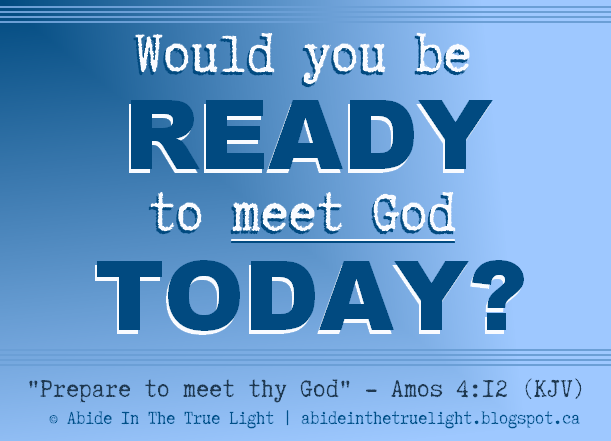 We will ask this again: Would you be ready to meet God today? Upon looking back at your life and the choices that you have made, would you be able to say that things have been right between you and your Creator? Has He been precious to you? 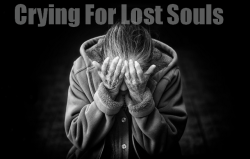 Has your soul overflowed with a deep love for Him? 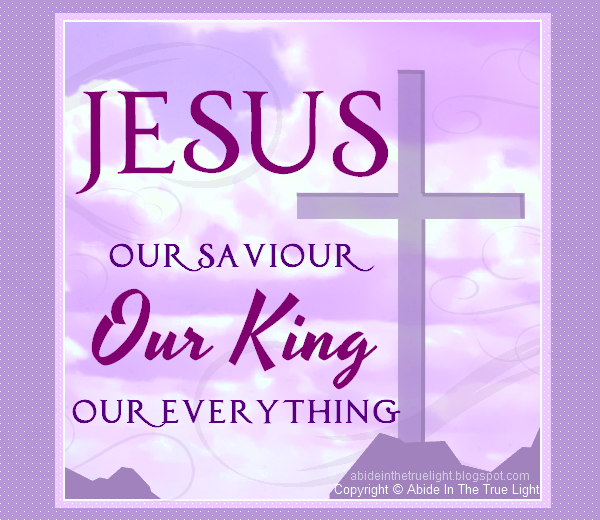 Have you called Him your Friend, your Father, your Savior, your King, your Everything? Have you strived to please Him and to obey His Word? Have you lived your life in a way that would bring honor and glory to His name? Search your heart for the answers. Be truthful. If you find that you either cannot answer or your answer is "no" to any of these questions, now is the time to make things right. Listen to the still, small voice inside of you that is saying, "Come unto me" (Matthew 11:28 KJV). God is speaking to you. Do not put him off until another day. It could be that you end up waiting until it is one day too late. That is a risk that is not worth taking. God has given you this day and you need to give this day to your God. 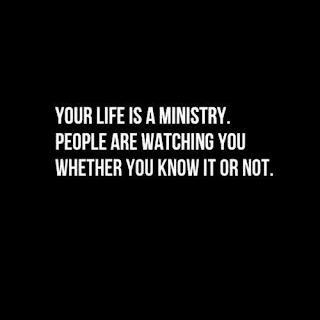 Spend time getting to know Him. Find time for prayer. Devote time to the holy scriptures of your King James Bible. Draw near to The One who knows you by name and loves you unconditionally. God is faithful and kind and He wants you to "come boldly to the throne of Grace" (Hebrews 4:16 KJV). He wants you to approach Him. He wants you to kneel before Him in earnest prayer and ask Him to help you get to know Him better. He will hear you. He will not turn a deaf ear on your prayer. He loves your voice. He loves your prayers, no matter how few words they contain. A simple "I love you, My Lord" is just as special in the ears of our God as any long and eloquent prayer. He is not looking for perfection, He is looking for sincerity. If you sincerely want to know Him and sincerely want to love Him, He will become yours and you will become His. He will open the doors and let you enter into a lifetime with Him. You will then be able to face death with the certainty that you will be spending eternity with Him! There is no fear in death for those whose hearts are right with Almighty God! In the coming days, there will be many eyes gazing upward toward the heavens in hopes of catching a glimpse of the unusual red-colored total lunar eclipse, known as Blood Moon. This event will take place in the early hours of Tuesday, April 15, 2014. There will be four of these lunar events, called a Tetrad, within a year and a half span. Amazingly, each one will be coinciding with the significant Jewish holidays of Passover and Sukkot (Feast of Tabernacles) in both the years 2014 and 2015. Following the April 15th Blood Moon, there will be another Blood Moon which will occur on October 8, 2014, another on April 4, 2015, and one more on September 28, 2015. There has been much speculation, excitement, curiosity, and mystery surrounding this, by both believers and non-believers alike. Is there a reason for this Blood Moon Tetrad? Is it a sign? Is it God's way of telling us to start preparing for His return? Only God knows. We are to always be prepared and to be watching for His return. He will come when He is ready. In His time. We will not know when. We will not know what day. We will not know what year. He did tell us, however, that there would be signs pointing to His return. He told us to watch for those signs so that we would know when it is near. 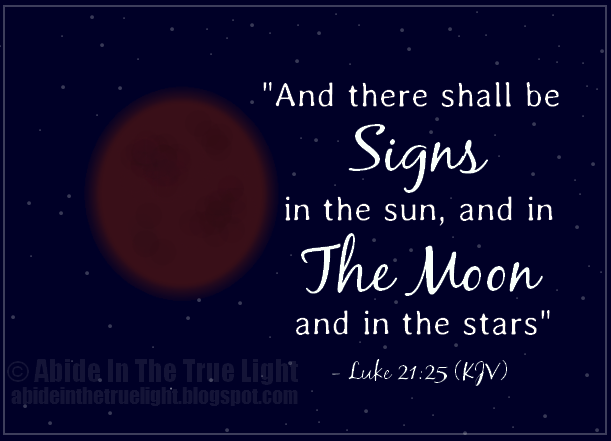 Luke 21:25-26 (KJV) - "And there shall be signs in the sun, and in the moon, and in the stars; and upon the earth distress of nations, with perplexity; the sea and the waves roaring; Men's hearts failing them for fear, and for looking after those things which are coming on the earth: for the powers of heaven shall be shaken." Joel 2:30-31 (KJV) - "And I will shew wonders in the heavens and in the earth, blood, and fire, and pillars of smoke. The sun shall be turned into darkness, and the moon into blood, before the great and terrible day of the Lord come." Our God created the moon. He placed it there. He created these lunar events. He alone knows the reason for it. He alone knows what lies ahead. He is all-powerful and all-knowing. Whatever the reason for this Tetrad, we know that our God is in control. There is a purpose for everything that happens in the heavens and on the earth. Everything works according to the Creator's will and according to His Word. Genesis 1:14 (KJV) - "And God said, Let there be lights in the firmament of the heaven to divide the day from the night; and let them be for signs, and for seasons, and for days, and years:"
Whether this Blood Moon be in the sky only for our pleasure or be it there as a reminder of things to come, let us stand in awe of our Creator as we look up and witness the beauty of these rare lunar events. Psalm 8:3-4 (KJV) - "When I consider thy heavens, the work of thy fingers, the moon and the stars, which thou hast ordained; What is man, that thou art mindful of him?" 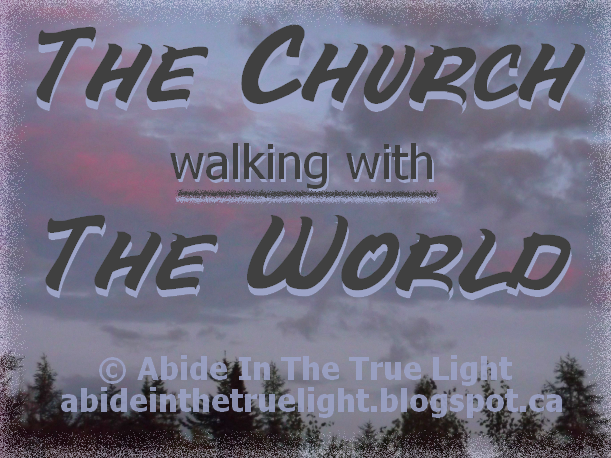 1 Chronicles 29:11 (KJV) - "Thine, O Lord is the greatness, and the power, and the glory, and the victory, and the majesty: for all that is in the heaven and in the earth is thine; thine is the kingdom, O Lord, and thou art exalted as head above all." Let us worship our God and declare His greatness as we marvel at His wondrous works in the heavens above! Psalm 19:1 (KJV) - "The heavens declare the glory of God; and the firmament sheweth his handywork." Psalm 89:11 (KJV) - "The heavens are thine, the earth also is thine: as for the world and the fulness thereof, thou hast founded them." We will not speculate further on the reason for the Blood Moons but we will encourage you to study God's Holy Word for yourself and determine for yourself whether this be a "sign" of His imminent return. We need to be watching and waiting and looking upward at all times. Not only during the Blood Moons.....but always. For, you see, our Lord's return could happen at any moment and at any time. It could be today. It could be tomorrow. It could be in the coming months. It could possibly be years from now. Only God knows. Matthew 24:36 (KJV) - "But of that day and hour knoweth no man, no, not the angels of heaven, but my Father only." In the meantime, let us be vigilant. Let us be ready. Let us be continually preparing ourselves for that joyful day when we finally meet our Creator and behold Him in all of His glory! Matthew 24:42 (KJV) - "Watch therefore: for ye know not what hour your Lord doth come." Are you ready for His coming? Have you asked God to come into your heart? If not, please visit our Salvation: How To Be Saved page for more information. Revelation 22:20 (KJV) - "Even so, come, Lord Jesus." Psalm 99:5 (KJV) - "Exalt ye the Lord our God, and worship at his footstool; for he is holy." Worship your Lord. 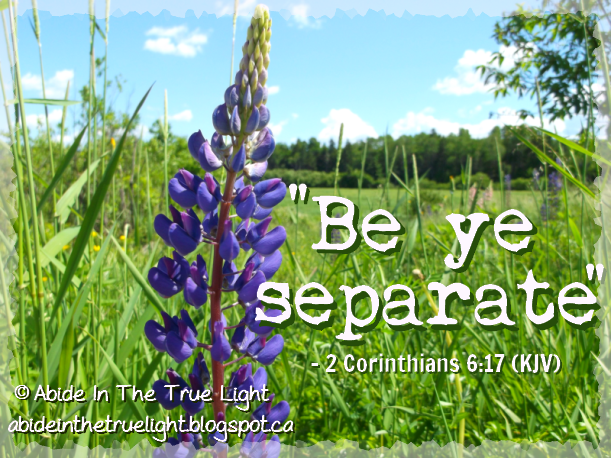 Open your heart and let the gentle peace of His divine presence refresh, restore, and renew you. Behold his goodness. Utter sweet words of love to your King. Sing with a joyful heart. Bow down before Him. Lift your hands in an offering of thanksgiving. 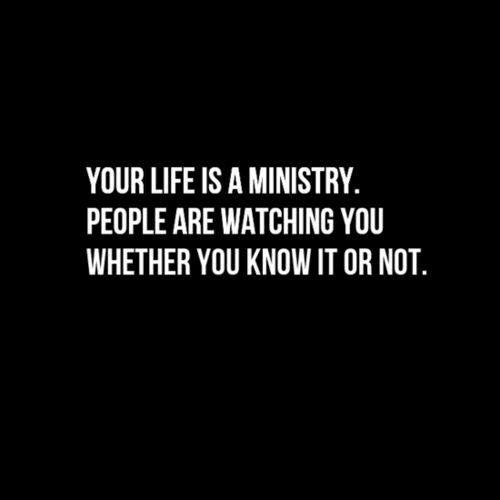 Magnify your God. Be in awe of your Creator. Let His strength lift you up. Let His light encompass you. Reflect on His tender compassion, His wondrous works, His faithfulness, His protection, and His unfailing love. Praise Him. He is The Almighty, The Holy One, and He is worthy of your highest praise and worship. He longs for it! God loves to be glorified and adored by His precious ones. 8- "Give unto the Lord the glory due unto his name: bring an offering, and come into his courts. 9 - "O worship the Lord in the beauty of holiness: fear before him, all the earth." Do not neglect the Spirit of the Living God which dwells within you. When you feel that certain stirring inside your soul, the stirring to spend time in worship, do not ignore it. Do not push it away. Whether it be in church or in your own home, whether with be with others or all alone - it is very important to spend time worshipping your Lord. The moments that you spend in prayer or song, will be the most significant and dearest moments of your day. All other parts of your day will fail in comparison. If you sincerely desire to have a closer, sweeter relationship with The Living God, take the time to love Him. Worship and adore Him and He will draw you nearer to Him. The more that you exhalt His name, the more that you will be able to delight in His spiritual presence and experience His nearness and dearness! 23 - "But the hour cometh, and now is, when the true worshippers shall worship the Father in spirit and in truth: for the Father seeketh such to worship him. 24 - "God is a Spirit: and they that worship him must worship him in spirit and in truth." 1 - "O come, let us sing unto the Lord: let us make a joyful noise to the rock of our salvation. 2 - "Let us come before his presence with thanksgiving, and make a joyful noise unto him with psalms"
3 - "For the Lord is a great God, and a great King above all gods." 4 - "In his hand are the deep places of the earth: the strength of the hills is his also." 5 - "The sea is his, and he made it: and his hands formed the dry land." 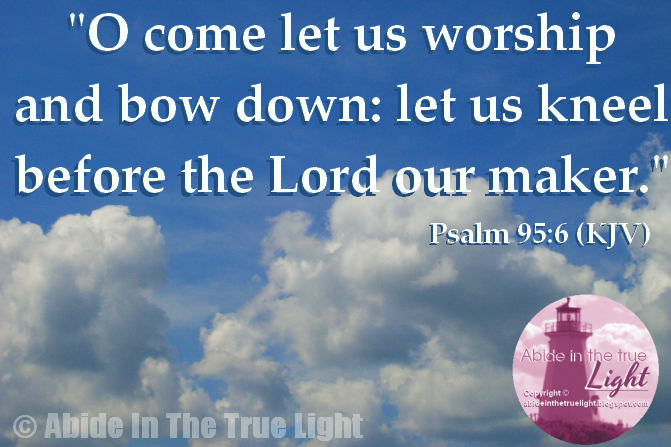 6 "O come, let us worship and bow down: let us kneel before the Lord our maker."